This is the Second of many historical articles about railroading in the Western New York area, written by Society Historian, Greg Jandura. As more articles are added, old ones will be archived. So sit back, or feel free to print out, and enjoy the rich railway heritage of Western New York. THE "PAN-AMERICAN EXPOSION - 1901"
As Western New Yorkers and Buffalonians, we are all quite familiar with the tragic assassination of William McKinley, 25th President of the United States, when shot by anarchist Leon Czolgosz on September 6, 1901 during a reception in the Temple of Music at the Pan-American Exposition. President McKinley would despite the best medical efforts known at that time briefly recover then take a turn for the worse, dying on September 14, 1901. Not only did we mourn his passing here, as did the nation, but the whole world grieved over this senseless tragic loss. The eyes of the world were on Buffalo! As there was talk of commemorating the centennial of this event this year, I became quite interested in this subject, the more and more I learned while pouring through the pages of Buffalo's local newspapers getting a first-hand feel for the era and events. What really stood out was the unknown story of the railroads involvement from the election campaign of 1896, and 1900, President McKinley's frequent train travel while in office, the great cross-country journey culminating at the Pan-American Exposition, the funeral train to Washington, DC and lastly to Canton, Ohio. And yes, even Leon Czolgosz's journey to prison for his execution after his trial and conviction was by train. To get a sense of beginning to this story, we must first go back to the Democratic Presidency of Grover Cleveland who served as both the twenty-second and twenty-fourth President. During his first administration 1885-1889 he had inherited five major domestic problems, involving the Federal Civil Service; Federal pensions; labor unrest; abuses by the railroads in their business methods; high protective tariff and huge treasury surplus of a half billion dollars accumulated since the Civil War. President Cleveland's objective was to lower the tariff. This in turn would discourage Congress from extravagant spending on "plum" political appointments and large pensions paid to Civil War veterans. A tariff reduction would also hopefully bring down the prices on basic commodities. As to the labor unrest, this was a time of the emergence of strong unified labor unions demanding higher wages, and shorter hours, which came into conflict with business owners. As to unscrupulous freight making rates by the western railroads, the Interstate Commerce Act became law in 1887 curbing these blatant abuses. The tariff was the principle issue of the 1888 political campaign. A bill to lower the tariff 7 to 8 percent passed in the House, but not the Senate. The Republican party led the public to believe that Cleveland, who only wanted to reduce the tariff also favored a free-trade policy which would enable foreign manufacturers to undersell American's costing him the election. Benjamin Harrison, twenty-third President of the United States 1889-1893 undid all that Grover Cleveland had worked for by disposing of the huge Treasury surplus through extravagant appropriations for pensions, naval vessels, lighthouses, coastal defenses, and other projects. The McKinley Tariff Bill was enacted raising already high protective tariffs resulting in higher prices on many household commodities. To gain the support of the western states, six had joined the union (Idaho, Montana, North Dakota, South Dakota, Washington, and Wyoming) between 1889-1890, the government promised to purchase liberal amounts of mined silver if these Congressmen voted for this legislation. In turn, the Sherman Silver Purchase Act of 1890 was enacted. The government agreeing to buy 4 1/2 million ounces of silver (nearly the total silver mine output) monthly and issue certificates for the full amounts purchased In 1890. The Sherman Antitrust Act became law declaring illegal "every contract, combination in the form of trust or otherwise, or conspiracy in restraint of trade." In reaction, to high consumer prices, the populace elected a Democratic Congress in 1892 and Grover Cleveland as twenty-fourth President of the United States 1893-1897. In total, McKinley made an estimated 300 speeches to 1,000,000 visitors in his home town. As from everywhere else, Western New Yorkers flocked to Canton, Ohio. These included a delegation from Chautauqua and Cattaraugus Counties chartering a 12 car train; over 1,000 real estate men chartering an 18 car train; 150 lumber men from Buffalo and Tonawanda chartering railroad cars as did 75 members of the Buffalo Wheelmens (bicyclists)Club. William McKinley received 7,035,638 popular votes and 271 electoral votes with William Jennings Bryan receiving 6,467,946 popular votes and 176 electoral votes. The voting was along sectional lines with Bryan carrying most of the South and West. McKinley carried the City of Buffalo, the eight county region of Western New York and New York State as well with about 60% of the popular vote respectively. The election of 1896 remains "critical" because of its lasting import as a milestone in the conflict between agrarian and industrial America. 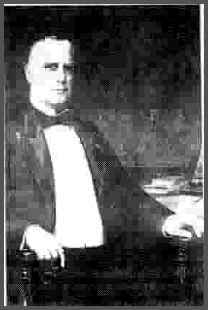 William McKinley was born in the semi-frontier community of Niles, Ohio on 1/29/1843 one of 9 siblings to working class parents. His MS. studies at Allegheny College in Meadville, PA. 1860-1861, were cut short by illness. He briefly taught school then enlisted at age 18 in the 23rd Ohio Volunteer Infantry during the Civil War rising through the ranks to 2nd Lieutenant and Brevet Major in 1865 under the command of Rutherford B. Hayes. William McKinley who saw considerable action during the war was committed to preserving the Union; was known as Major McKinley up and until his election to the presidency. Admitted to the Ohio bar in 1867, he practiced in Canton, Ohio. He became quite active in politics serving in the House of Representatives 1877-83,1885-91. During his congressional career, McKinley was elected chairman of the House Ways and Means Committee, which developed financial legislation, and he became a prominent national figure. He also worked for civil-service reform and other liberal measures. During his administration, William McKinley traveled extensively by train delivering speeches in a number of major cities, to special interest groups and returned to Canton, Ohio for several visits. He also embarked on several extensive train tours visiting the West in 1897, the Trans-Mississippi Expo in Omaha 1898, the South 1898, and New England in 1899. His most ambitious trip to win support for trust busting and for extending commercial reciprocity would be the 1901 Great Circle Tour of the United States. Starting from Washington, DC. through the Deep South, Far West, Pacific Northwest, and Midwest culminating with a visit to the Pan American Exposition in Buffalo, New York on President's Day June 13, 1901. The President and Mrs. McKinley accompanied by most of his Cabinet, their wives and members of the press-43 in all, would be departing Washington DC. on April 29, 1901 to return on June 15, 1901. "The total distance traveled will be about 10,500 miles, crossing 23 States and 2 Territories, and touching the Gulf of Mexico, the Pacific Ocean, and the Great Lakes. Twenty-seven railroads are embraced in the itinerary. Wherever feasible the State capitols were visited. Local programs are covering the cities at which extended stops are made. A feature of the trip will be the substitution of drives (short horse & buggy trips) for receptions, thus more fully accommodating the people then would be possible at a short reception. The Reception Committee will be received at the cities they represent the local various committees having cordially cooperated in this respect, as well as in others, in an endeavor to make the journey of the President and his party a most enjoyable and interesting one. While the President may make short addresses at several of the large cities and at some of the colleges and universities, it is not at all likely that he will make as many speeches as have been delivered in the course of previous trips." "The train in which President McKinley and his Cabinet will cross the continent on their travel is a marvel of luxury". It will consist of two sleeping, a dining, and a composite car, consisting of a smoking room and baggage compartment. The President will sleep in the magnificent Pullman "Olympia." A description of this car will fill an Oriental Prince with wonder. It contains five private rooms, finished in Mexican mahogany, maple, and koko. The private dining room, at one end, is furnished in Vermillion. Apartments fit for monarchs are provided for the servants. Silk, satin, plush and velvet are lavishly used in furniture decoration. Onyx and marble fittings are in evidence. Large mirrors and wardrobes are provided. Each private room contains three complete fittings of a bedroom. All have separate toilet rooms. The car is 70 feet long and is used only for the accommodation of nine persons. 1. "United States History." Funk & Wagnalls Standard Reference Encyclopedia, 1970 ed. 2. Carruth, Gorton. "What Happened When" Abridged Edition The Encyclopedia of American Facts, 1991 ed. 3. "United States History." Funk & Wagnalls Standard Reference Encyclopedia 1970 ed. 5. Smelser, Marshall, and Kerwin, Harry W. Conceived In Liberty: The History of the United States. Garden City Doubleday, 1962. 6. Withers, Bob. The President Travels By Train. Lynchburg: TLC Publishing, 1996. 7. Presidents and Famous Americans. The American Heritage Book 8. New York: Dell Publishing, 1967. 8. The World Almanac and Book of Facts 1989: Scripps Howard, 1989. Buffalo Commercial Advertiser, November 1, 1900. 9. "William McKinley." Encyclopedia Americana 1996 ed. 11. "The Presidential Train." New York Times 5 April 1901, p.I. 12. Withers, Bob. "The President Travels by Train". Lynchburg, TLC Publishing, 1996.